Melvin Fartknocker, esteemed nerd, is on a holiday. He has decided to go visit Santa to ask for the Christmas gift of his dreams...only, things unravel in ways he couldn't imagine. EVERYTHING. YOU HAVE NO IDEA. 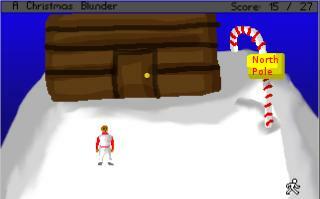 Didn't find the game "A Christmas Blunder" on the links above. The website link doesn't work, just gets the 404 message.